A nostalgic tribute to creature features from the 1950's, IT CAME FROM THE DESERT is a pulpy, action monster movie, inspired by Cinemaware's cult 1980’s video game of the same name. 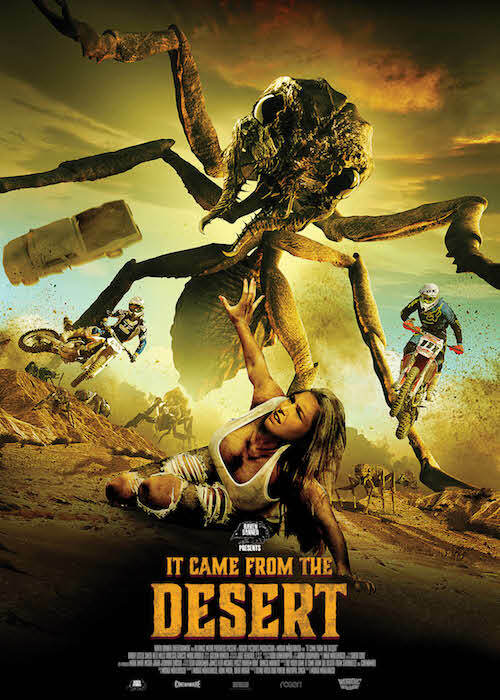 It features rival motocross heroes and heroines, kegger parties in the desert, secret underground military bases, romantic insecurities... and of course giant ants. Marko Mäkilaakso (WAR OF THE DEAD) directed and co-wrote with Hank Woon (AGE OF DINOSAURS) and Trent Haaga (68 KILL). Finland’s Roger! Pictures partnered with US-based legendary game developer Cinemaware to produce a motion picture adaptation of the classic 80’s game It Came From the Desert. The 1989 action-adventure game It Came from the Desert was inspired by dozens of 1950s "B" movies, especially the 1954 mutant-ant classic THEM!. The title references the 1953 horror film, IT CAME FROM OUTER SPACE. Emma-awarded Marko Mäkilaakso is a feature film director, but he is also known for his work on music videos, TV commercials, TV series and internationally recognized and awarded short films. In 2011, the world premiere of his directional debut WAR OF THE DEAD was held in Toronto After Dark Film Festival. Mark Arnold is an actor and producer, known for TEEN WOLF (1985), BLADE RUNNER 2049 (2017) and FLORENCE FOSTER JENKINS (2016). Harry Lister Smith is a British-born actor, known for WAR & PEACE (2016), MURDER ON THE ORIENT EXPRESS (2017) and GOD’S OWN COUNTRY (2017). Vanessa Grasse is a Canadian actress, known for LEATHERFACE (2017), ASTRAL and ROBOSHARK (2015).